The V50 that preceded it was sweet-handling but underpowered. A bump in displacement didn’t help much on its own and, to my knowledge, we didn’t get those in the US anyway. The V65 Lario hoped to address this lack of performance with an update from two to four valves per cylinder. Unfortunately, lubrication was not increased to handle the additional moving parts, and failures resulted. Although these are very likely to have been fixed under warranty by now, you might want to pop the valve cover off one of the heads, just to be sure. Black-finished cam followers will indicate the work has been performed. The move to four valves had just the effect you’d expect: little change at low rpm, and better breathing as the revs piled on. 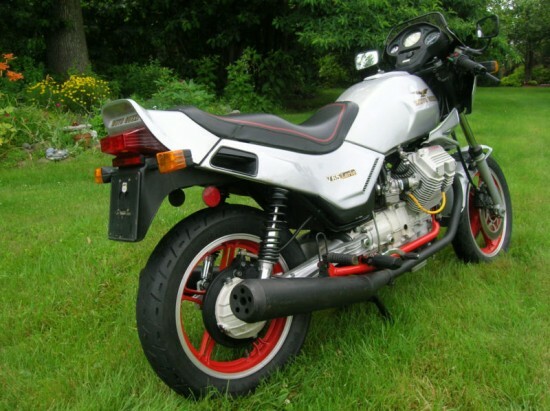 The bike could reach almost 115mph, not a bad figure for a 650cc twin. Unfortunately, the 16″ wheels on Guzzi’s of this era were a bit of a fashion statement, as the frames were not really engineered with geometry to flatter this tire: handling was universally twitchy and the bikes had a tendency to stand up under braking, characteristics at odds with traditional Guzzi stability. 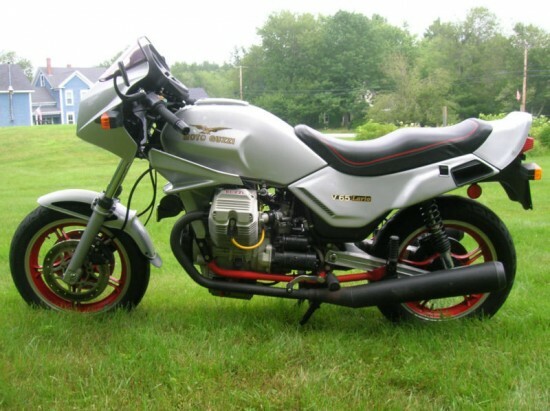 1986 MOTO GUZZI V65 LARIO, BIKE IS IN OVERALL NICE CONDITION, 21,131 MILES, THESE ARE RARE BIKES AND DON’T COME UP FOR AUCTION OFTEN. I PURCHASED THE BIKE FROM THE SECOND OWNER WHO HAD IT FOR THE LAST 22 YEARS,AND WAS ALWAYS DEALER MAINTAINED,, BIKE SAT FOR THE LAST 5 YEARS IN A HEATED WAREHOUSE, SINCE I PURCHASED THE BIKE I HAVE GONE THROUGH THE CARBS ,INSTALLED A NEW BATTERY,CLUTCH, FLYWHEEL AND STARTER, BIKE RUNS GOOD, SHIFTS GREAT , BRAKES ARE GOOD AND THE LIGHTS WORK,,,BIKE IS LIGHT AND NIMBLE AND IS A BLAST TO RIDE… MILEAGE WILL CONTINUE TO INCREASE AS I DO RIDE THIS BIKE..IT ALSO HAS DYNA COILS AND IGNITION,ACCEL 8.8 PLUG WIRES AND K&N AIR FILTERS, THERE ARE A FEW BUMPS AND BRUISES ON THE PAINT AND PAINT PEELED ON FRONT FENDER, BUT PRESENTS VERY WELL AND GETS LOTS OF COMPLIMENTS..THE CENTER STAND HAS A SMALL PIECE MISSING AS SEEN IN PICTURE, TIRES ARE ABOUT 75% NEUTRAL LIGHT IS NOT WORKING,INSIDE OF TANK HAS NO RUST, BUT THERE IS SOME RESIDUE FOM OLD FUEL,I INSTALLED INLINE FILTERS AND IT SEEM TO BE GETTING CLEANER EVERY TANK OF FUEL I RUN THROUGH IT..ALSO I WOULD RECOMMEND A NEW GAS CAP,,,PLEASE LOOK AT PICTURES CLOSELY AND ASK ANY QUESTIONS YOU MAY HAVE, THANKS AND GOOD LUCK BIDDING.. The V65 Lario came fairly late in the production-cycle of these smaller twins. Despite a familial style and configuration, they shared few parts with their bigger brethren, so be careful assuming parts availability will rival the larger Guzzis. 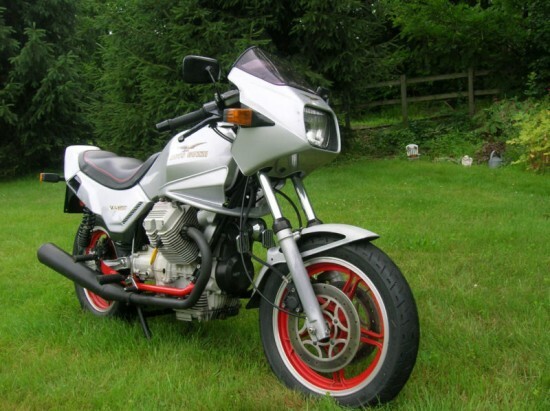 But take idiosyncratic handling into account and ride your sweet little Guzzi on a Sunday afternoon. 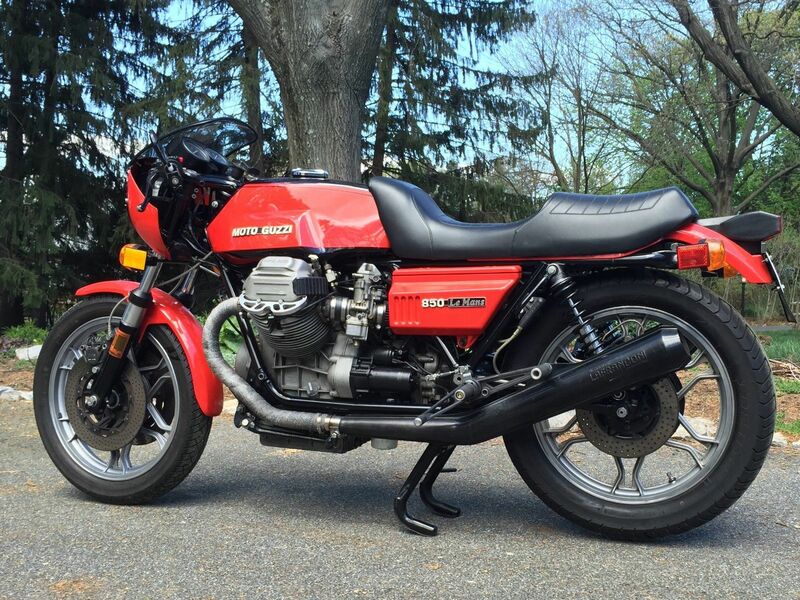 Be happy your friend didn’t lose the really cool key these Guzzi’s came with. 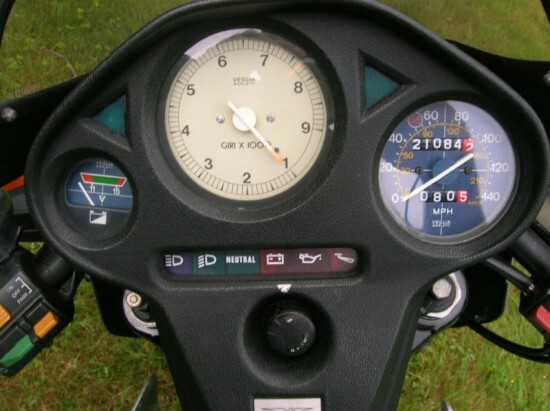 Watch the revs build on that gorgeous, white-faced Veglia tachometer and smile. You certainly won’t see yourself around every corner, and the styling of these 80’s machines is finally starting to be appreciated.